This print can also be purchased as a complete set with the three other prints of the original ink artwork of A Delicate Balance Set of 4. This piece was drawn by hand using Micron 0.5mm pens and is the first in A Delicate Balance series. I did an original run of 15 prints which sold out right away. I wanted to have the same amount available as the rest of the large Delicate Balance pieces so I decided to do a second run of 100 limited edition prints. 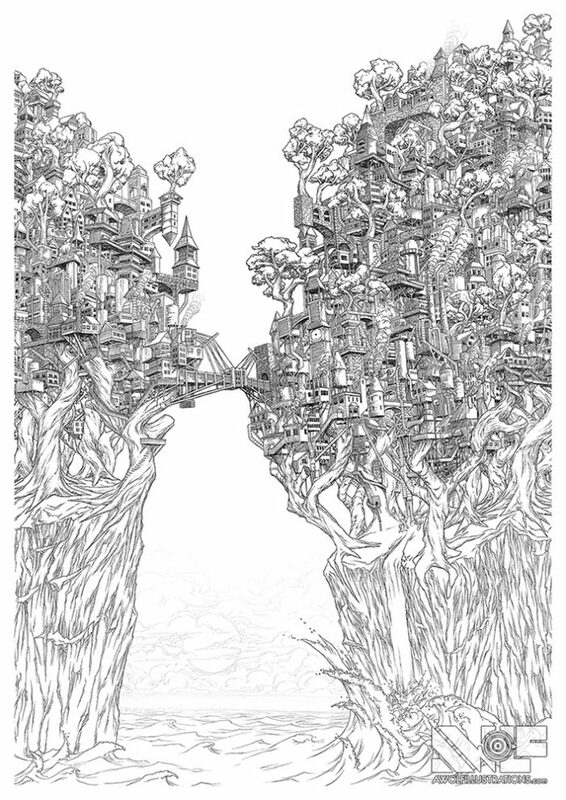 I updated this piece by adding more tree trunks to the base of the city which gave it more weight and I did some reconstruction, replacing the bridge with a sturdier structure.